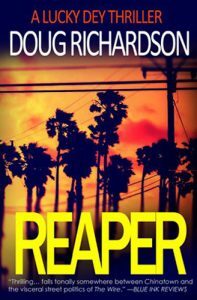 Doug Richardson first gained national attention when his screenplay Hell Bent… and Back was the first spec script to sell in Hollywood for a million dollars. 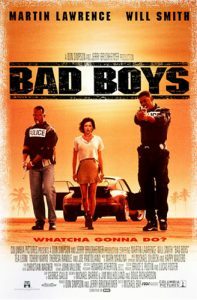 He later went on adapt Walter Wager’s novel 58 Minutes into what was to become Die Hard 2, as well as writing/producing films such as Bad Boys (1995), Money Train (1995) and Hostage (2005). In between projects, Doug turned to writing thriller novels and penned his first novel, Dark Horse in 1997. Blood Money (2013) is the first of his continuing Lucky Dey thriller series. Here, Doug talks novels vs. screenplays. LH. You began your writing career as a screenwriter, what drove the decision to delve into novel writing too? DR: In screenwriting the natural progression is to direct. Since my wife and I were planning a family, I wasn’t interested in abandoning my children for the year or so it takes to helm a picture. So I tried writing a book. After that, any yen I had to direct was pretty much satisfied. LH: When a great idea first springs to mind, how do you decide whether to develop it into a screenplay or a novel? DR: It used to be about do or do I not see it on the screen. Is it marketable? Can the story be told well with just sound and picture? Or is it better told more internally? At least that used to by my fulcrum. Of late, since I’ve committed to writing Lucky Dey books, it’s divided into Lucky Dey or not Lucky Dey. LH: Have you ever considered writing a story idea in both screenplay and novel formats? DR: I suppose I already have when I adapted my first two novels into screenplays for different studios. LH: I was once told that screenwriters make great novelist because their craft means they’re more used to going straight into the action rather than filling the page up with unnecessary description, do you maintain the discipline of ‘less is more’ on the page or welcome the chance to embellish when writing novels? DR: Whether writing a book or movie the mantra is the same. Be compelling. Don’t be boring. Useless an unnecessary description is just that, useless and unnecessary. I’m currently revising my seventh novel and doing just that, omitting what is not necessary to tell the story. As for screenwriters making great novelists, well, publishers have a different view of that. If you’re submitting, strongly suggest you don’t reveal you’re a screenwriter. Publishers look down on screenwriters and assume they’re hacks. Sad news but true. LH: In what ways has your screenwriting discipline influenced your novel writing style (or vice versa)? DR: Initially, the screenwriting discipline influenced negatively. I was too concise. The first few chapters of every book read like an outline. Since then, both screenwriting and novel writing inform the other. Screenwriting teaches you to be visual. Paint pictures, etc. Novel writing exercises the use of language so that when I turn back to screenwriting, I’m even more articulate and spare in what I need to put across. LH: Both your screenplays and novels contain some brilliant action sequences, what’s the best advice you can give us on writing compelling action scenes? LH: Is there a similar story structure within screenplays and novels? How easy was the transition from writing acts to chapters? DR: Good storytelling is structured. Just like telling a joke or how a strong argument is structured. Movies don’t have to be three acts. Books don’t have to be chaptered. Just make it compelling and build your own structure that best serves the story. LH: Do you use the same process when writing a novel as you do when writing a screenplay, in terms of pitching an idea, outlining, rewriting etc.? DR: My process has always been what is best to achieve the end result. A well told tale. Sometimes I use cards on bulletin boards, outlines, kitchen sink lists. As much as I need to do to make me comfortable starting on page one. Now that’s my process. Sometimes, especially when screenwriting, it’s about someone else’s process. A studio might need to be pitched, read outlines, etc. Those hoops need to be navigated. Books not so much. Especially my Lucky Dey series. That goes where I want Lucky to go and nobody else has a say. I have to be my own harsh boss. LH: Which do you find easier, is quicker to write, and pays more, screenplays or novels? DR: Screenplays are quicker per draft. Then again there are the endless rewrites at the behest of the producers, directors, studios, stars. Screenplays generally pay more. At least if you’re a screenwriter in demand. It’s a market thing. Novels, on the other hand, can be a cash machine if you’re a perpetual best seller or JK Rowling. LH: Lastly, can you tell us a bit about your latest project? How you developed the concept, what stage it’s at, and where it’s headed etc.? DR: Like I said before, I’m writing Lucky Dey thrillers. The fourth in the series, AMERICAN BANG, will land in late spring. There are a few movies ideas in development. I usually don’t chat about them until they’re in production. In addition to writing for the screen and print, Doug posts a weekly blog on his website, dougrichardson.com, where he shares personal anecdotes and insight from his thirty-year showbiz career. 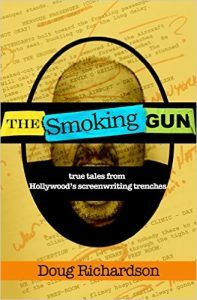 The first collection of his blogs, The Smoking Gun: True Tales from Hollywood’s Screenwriting Trenches was published in 2015. You can also connect with Doug on Facebook and Twitter too.